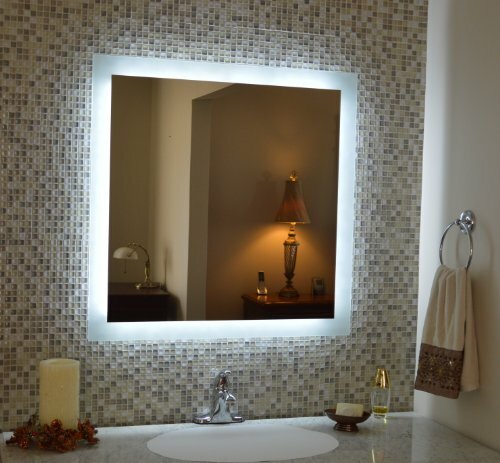 MAM93636 is a 36" Wide x 36" Tall Side Lighted LED Mirror Commercial Grade ( Approx. 2 1/2 inch around the edge of mirror is clear frosted glass) ALL MIRRORS SHIP IN 1/2 " PLYWOOD CRATES All our Mirrors Carry a 5 Year Warranty, they all have a 50,000 Hours LED Burn Life ( Using the mirror 3 hours a day means it will last 45 YEARS) The 36" x 36" mirror mounts on a Aluminum Back Frame 1 1/2" deep w/SS Hardware and has a direct wire ( pig tail) connector for electrical wiring. LED's are rated at 6,000 Kelvin (White Light-Sun Light) which makes it a perfect make up mirror. New 18 Watt LED's-7400 lumens-56 Watts. Cost around 1/2 cent to burn per Hour. 5mm Thickness ( about 1/4 inch) Moisture Proof Backing, 100v AC-240v AC Power Regulator to 12v DC, comes with mounting hardware. Ads Luxury to Any Bath Decor-Women Love Our Mirrors !!!!! If you have any questions about this product by Mirrors and Marble, contact us by completing and submitting the form below. If you are looking for a specif part number, please include it with your message.